Software Design is possibly amongst the most critical tasks that a software firm undertakes and KPIs classified under categories such Quality, Exception Handling and Operations, Logical Size and Design Efforts act as excellent enablers for success of this process. Quality Perspective is essentially used to gauge the compatibility, security bearing capability, reliability and other quality enhancing features. This is important in ensuring that 'well quality outcome' is produced. Exception Handling and Operations can be known with the help of metrics like exception failure fraction, number of run time exceptions, number of operations and number of manually created exceptions. Logical Size and complexity aspect can be had with SLOC measure, average development time, cyclomatic complexity and blank line contribution. Design efforts can be obtained by fractioning the total amount of efforts in the form of indicators like study, create, review, testing and correction. Software design metrics help improve apps and apps development process and avoid unnecessary bugs and expenses related to their fixing. It's also recommended to measure development cycle time and measure each development stage in terms of time invested and expenses. Exception failure fraction and number of run time exceptions are among other important indicators. 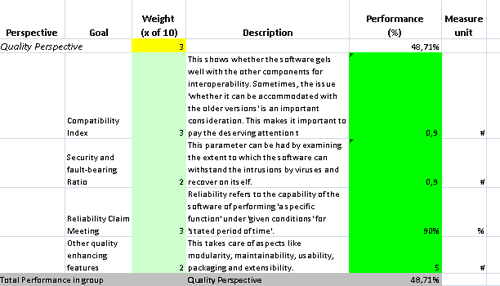 Download trial version of Software Design Performance Indicators. 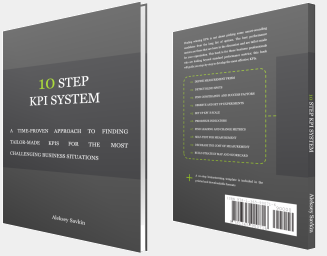 Purchase full version of Software Design Performance Indicators + bonus. Designing software is a highly technical field that demands being cautious about every step and decision. It aims at devising solution for IT (Information technology) problems. 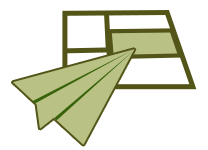 The subsets include both low-level constituents and algorithm usage issues. Also, the architectural aspects come into picture, when one is talking about constructing software. To successfully get over with this job, one needs to carry out a SRA (Software Requirements Analysis) to have the specifications about the software engineering. The timely completion of these jobs that too within the given cost frame makes it compelling enough to dig a 'measurement strategy'. Therefore, groups involved in such 'software structuring' subject frequently go with BSC (Balanced Scorecard) i.e. a collection of KPIs (Key Performance Indicators) to help impart 'quantitative' touch to the whole process. By getting into the area of 'software designing' and coming up with factors (that have true affect on 'pace of things' in this path), one can create a beneficial set of indicators to count the steps. However, extracting maximum benefits from this demands that only those indicators be selected that can actually reflect the progress of the area. Related metrics and KPIs for: Functional Software Testing, Programming. Customers who viewed this item also viewed: Outsourcing Scorecards | Quality Assurance Scorecards. 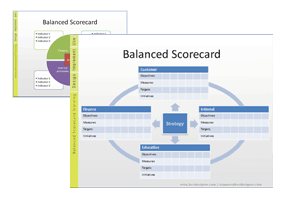 This is the actual scorecard with Software Design Performance Indicators and performance indicators. The performance indicators include: quality perspective, compatibility index, security and fault-bearing ratio, reliability claim meeting, other quality enhancing features, exception handling and operations perspective, exception failure fraction, number of run-time exceptions, number of manually created exceptions, number of operations, logical size and complexity perspective, sloc measure, average development time, cyclomatic complexity, blank line contribution, design efforts perspective, study, create, review, testing, correction. 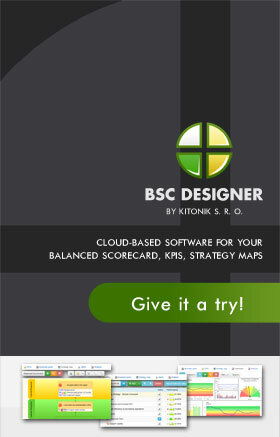 Download a trial version of Software Design Estimation Balanced Scoreboard or purchase a full version online. All articles about measuring performance in Software Development.